Quick Links: Oil filter for 2014 double cab 4.0 New Phone Mount for the Truck! Rear LED Amber light strip for turn signals Spacers Question Tie down ancors Got a shell, what would you do? 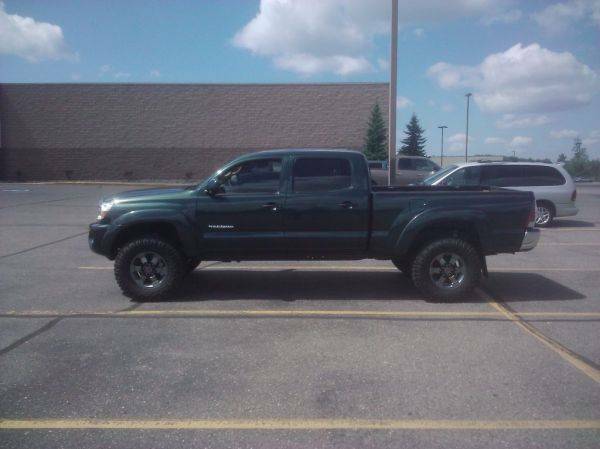 Discussion in '2nd Gen. Tacomas (2005-2015)' started by mwinslow, Oct 22, 2010.
does anyon have a lifted timberland green yota? ive searched and searched and have not found any. im ryin to decide weither to go black or chrome rims. i just ordered a low pro uws box thats gettin line-x. pickin that up on monday. so any1 put in on this, black or non black rims? also what is the yellow wire mod? whats the best 6 inch kit do yal think worksbest with these trucks? Fabtech for 6" but i'd do RCD 5" if i went with a DB lift.